Those arriving on August 9 were pleasantly surprised to find that the destination hotel "The Old Mill" resembled a movie version of an old English Tudor manor. Inside however, the arrangements were thoroughly modern. The first night reception took place in Tom Payne's room which, fortunately, had a large balcony to accommodate the overflow of guests. On Thursday the convention commenced in the Balmoral Room with the singing of national anthems (Polish, Canadian and US) by Kinga Mitrowska, voice coach of Anna Wojcik our Marcella Sembrich Competition winner. The invocation was delivered by Fr. Philip Majka. Debbie Majka introduced the Vice Consul of Poland in Toronto Natalia Iwaszko and Mayor of Mississauga Bonnie Crombie. Her Honor spoke about the diverse community she serves and how her own Polish roots positively affect her life. ACPC president Tom Payne then welcomed all who came to participate in this year's convention. Cecilia and Ray Glembocki reported on plans for the 2017 National Conference for the Social Studies in San Francisco NCSS (Nov. 17-18). They showcased two books: A Guide to the History of Poland and Why I am Proud to be Polish which they will try to distribute to interested parties. They also gave out a 4-page booklet Polish Heritage in the Washington DC Area. Jaroslaw Golembiowski encouraged participation in the "Polonika" Polish Art website project initiated by the Polish Ministry of Culture. This is an attempt to create a world-wide data base of monuments that commemorate Polish achievement and projects built by Polish artists and engineers located outside Polish borders. Interested parties will find more information on the website and are invited to contribute information and photographs. (see: www.polonika.gov.pl) Unfortunately, this project is just getting started and the English language version of the site is not yet operational. One unresolved issue is the place and/or host organization for the Spring Board Meeting and the 2018 Convention. Interested persons should contact Tom Payne. At noon the lunchtime speaker was Beata Golembiowska (not related to Jaroslaw) who gave an interesting presentation on her two books: In One Suitcase - on Polish aristocrats living in Canada and Theater without Borders about Polish theater in Toronto. To say the least, this was an unexpected exposure to two unexplored facets of the Polonian diaspora. 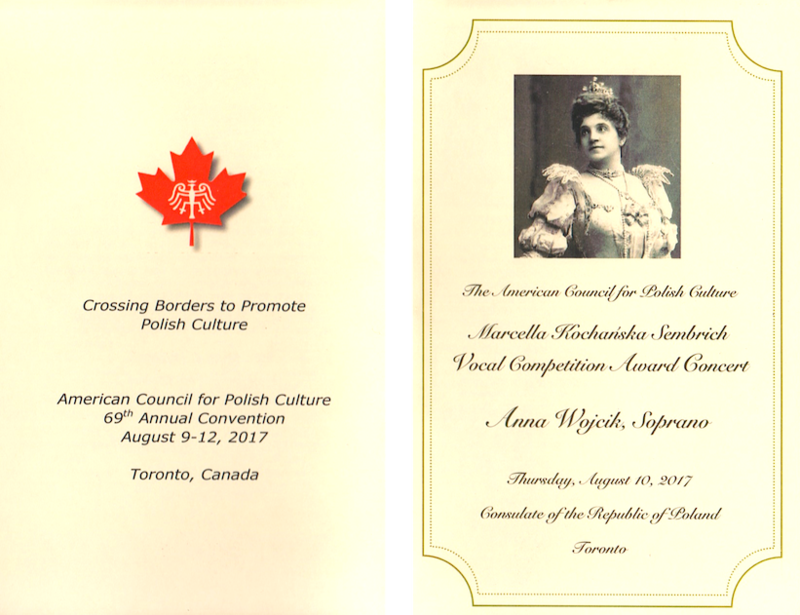 Later, we met the team of Maria Nowotarska and Agata Pilitowska, Torontonians who are carrying on the tradition of performing in Polish. Their specialty is two-person performances on various famous and less-well-known Polish personalities of the arts. Later this year they will perform their Monsieur Chopin at the Polish Home in Philadelphia (Dec. 9). Late afternoon on Thursday, convention participants hastened to the Polish Consulate General on the Ontario lakefront for the Marcella Kochanska Sembrich concert. The competition winner was 17 year-old Anna Wojcik of Toronto, a student at the Cawthra Park Secondary School. She has been studying voice with Kinga Mitrowska since she was nine. A winner of many competitions, Anna has taken part in the International Festival of Religious Song, the Festival of Polish Song, the Annual Carol Competition and the Talent Nation Rising Star Showcase. She has appeared as a soloist with the Toronto Sinfonetta, the Celebrity Symphony, and the Camerata Chamber Orchestra. She has performed in Brampton, Buffalo, Chicago and Warsaw to much acclaim. In 2015 she won the American Protege Competition and appeared in Carnegie Hall for the winners' recital. She is the 2016 recipient of the Emerging Music Artist MARTY Award. Vice Consul Natalia Iwaszko, acting in place of RP Consul General Grzegorz Morawski, welcomed a large crowd of over 130 people, that included many members of Toronto Polonia, to the Consulate. Our soloist was superb and expressive, drawing much applause. Alex Wang, her accompanist on the piano, was absolutely outstanding. He is also a student in the music program of the Cawthra Park Secondary School. It was a pleasure to see such talented young people perform at a level equal to that of seasoned professionals. On Friday morning the group boarded a bus and toured the city of Toronto. The ride included a visit to the Roncesvalles Avenue area which is the traditional Polish neighborhood of Toronto. In nearby Beaty Boulevard Parkette we visited the Katyn Memorial, and two smaller tablets, one commemorating the Smolensk Tragedy, and the other, Polish citizens who after 1940 were forcibly exiled into labor camps and often worked to death. There was barely time to visit the Chinese Market on Spadina Ave., look over Casa Loma, pause at the Distillery District on the Lakeshore and do a quick bit of shopping at the LCB Store before going back to the Hotel. That day the lunchtime speaker was Tomek Kniat, Publisher of the Dziennik Polonii w Kanadzie, who informed the delegates about POLcast an audio magazine available through the internet on computers, tablets and smartphones. The awards banquet took place in the elegant Humber Room of the Old Mill Hotel. The Founders Award was presented to Florence Langridge; the Cultural Achievement Award to Jaroslaw Golembiowski; and Distinguished Service Awards to Anthony Bajdek and Ray Okonski. Each awardee left the audience a few words to ponder, but most eloquent was the 92 year-old Ray. During his tongue-in-cheek presentation he spoke about how he "made" his money the old fashioned way (by printing it) and underscored his "cash to burn" finish by spontaneously igniting a fake fifty-dollar bill. His listeners received samples of genuine two-dollar banknotes as souvenirs. It was an enjoyable evening that was toasted later in Tom Payne's "hospitality suite." Thus concluded the ACPC's visit with our friends "up-north" and the hope that we will meet once again at the next convention after year's passage. 1. Dave Motak again produced a superb program that featured a custom Convention logo, beautiful color, and the Toronto Coat of Arms "Diversity our Strength"